Learning doesn’t always take place in the classroom. At Windstar Lines, we understand the importance of getting students out to experience the world. That's why we offer our school bus rental service. Student travel is a great way to expand your student’s ability to learn. 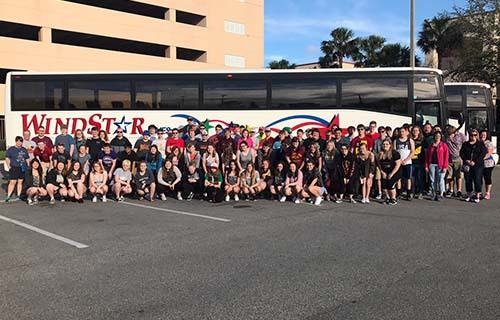 In the past 20 years, thousands of students, teachers, parents, and chaperones have traveled safely and comfortably aboard a Windstar Lines school bus rental. No matter what the size of your group is or where you are headed, we’ll take the worry out of your trip. Our School Bus Rentals are Top-Notch! What Sets Windstar School Bus Rentals Apart? Our Drivers: Uniformed, trained professionals, who are student-friendly! Our drivers are hand-picked for their customer service, flexibility, and compatibility. Our drivers will make your trip hassle-free! Our Fleet: We offer a variety of charter bus rental options, from 21 passenger to 56 passenger, VIP, sleeper, and handicap accessible. Our Standard and Optional Amenities: Our charter buses offer plush, spacious seating, WiFi, 110V outlets, DVD players, light-filtering window coverings, satellite programming, flat-screen TVs, and state-of-the-art climate control systems.